Groot and Rocket were basically pretty easy - a painters coverall with pipe insulation of all different sizes - some cut in half some full tubes to show roots - they were attached with hot glue. Bark of flat foam cut in weird shapes covered the chest area. Then we used spray on window sealant to add some more roots and lastly we painted with aresol cans of green, gray and browns - we had to have him wear it while we painted since there was so much white to have to cover and so many knooks and crannies! (I think we were all high that day) For the stilts - we used flat foam and covered it just like the painters coverall then wrapped the stilts. John's Groot head was flat foam that he 'molded' with hot glue and slits, a bit of texturing roughed it up, then painted and added model moss - he covered the eyes with the "sunglass film" the eye doctor gives you when your eyes are dialated. Rocket is David - John's 12 year old son - with an old astronaut costume fabric painted orange. Gloves and shoes were covered with fur fabric and safety pins. He used his Rocket mask that he received at a preview of the movie and then toted around his biggest Nerf gun to complete the look. 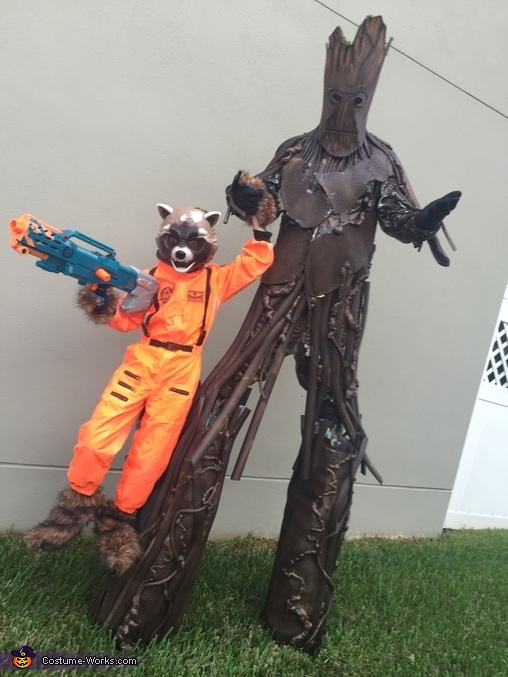 The stilts were modified a bit to add a "step" that Groot could hoist Rocket up on and they spent more time posing for photos that trick or treating that night!!! !